We get asked a lot where does our Wild Salmon come because people are aware that driftnet fishing for Wild Salmon was banned in Irish waters from 2006. The Irish Government allow a limited number of individual fisherman to catch Wild Atlantic Salmon by hand with simple nets in selected rivers and estuaries that have a strong population of Wild Atlantic Salmon. This traditional and sustainable method of catching Wild Salmon is called draft net fishing. Quinlan’s Kerryfish is licensed to acquire these sustainable Wild Salmon to produce the famous award-winning Quinlan’s Kerryfish Wild Irish Smoked Salmon. The Wild Salmon season starts in the middle of May, with a small number of wild salmon being caught. 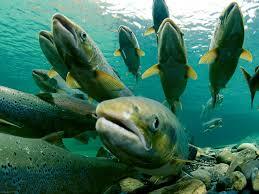 As the season progresses towards August the amount and size of the Salmon increase. Fishing is only allowed on certain days and the fishermen are only allowed to catch a small number of fish each day. We got our wild salmon from two sources, the Laune Estuary in South Kerry and the Cashin Estuary in North Kerry. In 2014 we introduced a passport for each Wild Smoked we have smoked. When you receive your Quinlan’s Kerryfish Wild Smoked Irish Salmon the passport will identify the unique salmon number from the limited number of Wild Salmon from that year.